Markets appear to be pricing in an imminent Bank of Canada rate hike on Wednesday. Here’s why Maclean’s believes interest rates are going up. 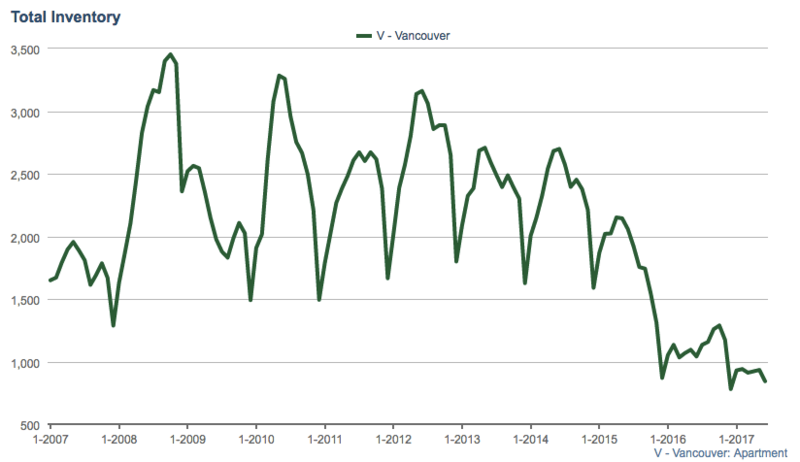 Should Stephen Poloz and the Bank of Canada follow through with an expected 25 basis point increase it will likely have a few impacts on Vancouver Real Estate. First, it has the potential to create a psychological change or a shift in the market. The real estate market has gotten comfortable with historically low interest rates, the first rate hike in over a decade should signal to the market that borrowing money is about to get more expensive, and ultimately buyers purchasing power will be lowered. Could this trigger sellers to cash in now? With condo inventory at a decade low it would certainly be a welcoming change. Canadians owe $211 Billion on Home Equity Lines of credit. With real estate prices rising, more and more Canadians have been using their homes as ATM’s. With the average balance of a HELOC around $70,000 and nearly 40% of people with HELOC’s not making regular payments against the principal, rate hikes become a growing concern. Not to mention, most are set at variable rates. So they’re certainly heading upwards. They’re also considered “demand loans” — which means, unlike a mortgage where as long as you make payments you’re fine, the lender can call them in at any point and insist on being repaid. While it’s expected variable rate mortgages will increase anywhere between 15-25 basis points, fixed term mortgages rates are also rising. The Canadian 5 year Government bond yield, which is tied to fixed term mortgage rates have been surging. 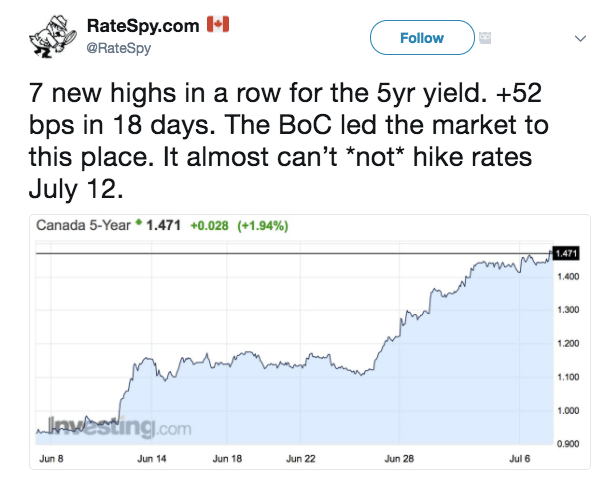 Yields have spiked nearly 60% in the past two weeks as markets prepare for the Bank of Canada announcement on Wednesday. While it’s expected we will remain in a low interest rate environment, even a few small increases combined with OSFI’s proposal of further stress tests and we could see borrowers really start to feel the pinch.